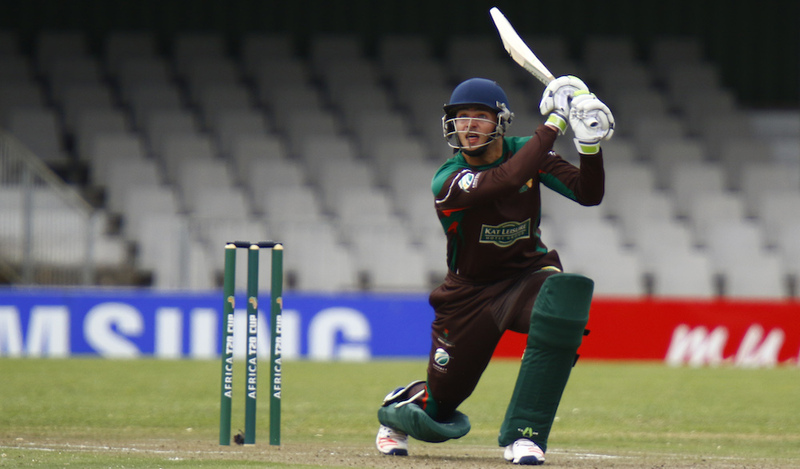 Marco Marais had a blistering Africa T20 competition with the Border team and is looking to continue his top form with the Nelson Mandela Bay Giants in the Mzansi Super League. Less than a year ago Marais shattered a 97-year-old world record when he smashed the quickest triple-hundred in first-class cricket history. The 25-year-old farmer from Stutterheim was picked in the 10th round of the Draft and will look to power blast himself through the tournament one ball at a time, especially after the fiery form he showed during the Africa T20 tournament. Marais spends his time away from cricket farming with his brother, which is by no means an easy occupation. ‘It’s a bit easier to hit a six than clean out a chicken coop,’ laughed Marais, who adds that the time he spends on the cricket field ‘helps me clear my mind and I think it keeps me hungry to do well’. ‘Being allowed by my coach to play with freedom (in the Africa T20 Cup) really made it easy to just go out and have fun. T20 cricket is short and sharp so I do believe you need to express yourself,’ added Marais. The Stutterheim farmer is excited at the prospect of playing in front of the St George’s Park crowd. ‘I’ve never experienced the band ever, so I’m looking forward to the #Gees and obviously to play at such a quality stadium,’ he added. He will be playing alongside England International Jason Roy, Proteas spinner Imran Tahir, all-rounder Chris Morris as well as Border and Warriors teammate, and fellow power hitter Christiaan Jonker. Marais says he looks forward to ‘learning from everyone in the team as well as the coaching staff (because) it’s an amazing opportunity. My dad said I need to be a sponge while I’m with the team’. The Nelson Mandela Bay Giants play their first game against the Jozi Stars on 17 November in Johannesburg and their first home match of the season on November 23 at 7:00pm against the Durban Heat at St George’s Park. Tickets for the match are available at Ticketpro or at the St George’s Park Ticket Office.